Our brand new playgrounds are under construction and we can’t wait to show you the finished result! In this picture we have two different sets of equipment: the playground for 3-4 year-olds is in the foreground and the set for school-age children can be seen behind it. Soon we’ll be adding a large canopy between the two sets so that children can spend ample time outside. Here you can see the groundwork being laid for our playground for 2-year-olds. 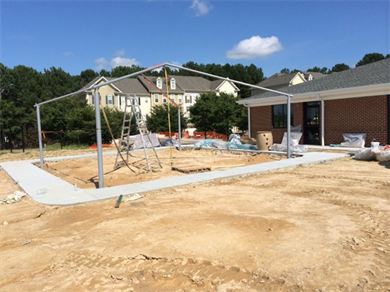 The large canopy being built represents another one of our efforts to ensure that children will enjoy their time outside in a safe and comfortable environment. Research has shown that spending time outdoors not only encourages a sense of well-being, but also enhances learning abilities. We will be incorporating outdoor activities into the curriculum, so stayed tuned for those details!